Welcome to the seminar blog for today’s event on the NBAA stage at 6:30pm. If you were at the seminar then the following information will be valuable to be able to follow up with. If you were not at the seminar, you can get caught up on what we covered and perhaps plan on coming to the next seminar on Saturday at 1:00pm. The cure for cabin fever has arrived with temperatures climbing into the 60’s and at worst, averaging out into the 40’s. I can remember just two weeks ago of having that desperate feeling of being landlocked without even the hope of rolling the boat out. Without a doubt there will be some unstable weather ahead but one thing is for sure…this isn’t 2009 where it was in the 20’s every single day and it took until nearly May for winter to be over (or at least convince me that it was over). For me, boat issues come to mind first. There are still a couple of spots to finish with the new carpet I installed last year. Instead of trying to do the project and fish at the same time I think I’ll get it done sooner than later. Riding this wave of motivation should make it easier to complete a couple of other updates to the boat. It will make life on the water more comfortable. Oh that’s right…there’s some yard work, bricks on the chimney to fix, a slate patio to finish. All that can be done now too! One must prioritize however and I try to keep a 4 to 1 ratio between fishing and yard work. 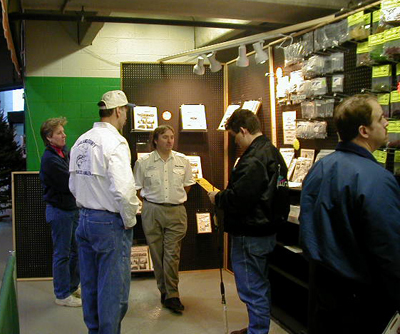 Anybody remember this 40 foot booth at the Ultimate Sports Show Grand Rapids in 2001? The biggest sports show in the state is coming up in Grand Rapids next week (Ultimate Sports Show Grand Rapids). It is a great opportunity catch up with everyone before we all get busy again plus make a couple of additions to the tackle lineup and attend free seminars with excellent speakers on the topic of our choice. The Xtreme Bass Tackle booth will be there as will the last installment of the Bass to the Future seminars. This seminar is focused on putting as many sources of information on display for you to choose from. We will cover free internet sources, a free download, how to make the most of the tools you have and if you are planning on fishing Lake St. Clair, two new websites that I offer: Fishing Spot Specs and Marked Maps Live! This is truly a great show with a wide appeal to sportsmen and family members alike. A comfortably warm place to be with a lot to do while the cold wind and snow are blowing outside. As it turns out, Dan Kimmel and his Great Lakes Bass booth is right across the aisle from us so there’s been a lot of traffic back and forth. The new upgrade to the X-worms has been well received by both the staff and customers alike. If you would like to support a worthy cause the MSU Bass Fishing Team is represented each day at the booth and they have an attractive T-shirt for only $12 which will help them finance their tournament events this year. The first installment of the NEW Bass to the Future seminar format rolled out last night and it was fun. It’s always a challenge to get ALL the information out and this format does it better than any I have used to date. It also opened up the seminar content more for questions and comments which is the best part of all. We were able to explore a few points like sonar screen color selection, how to use an SD chip in the units and coordinating information in greater depth than usual. The #1 goal for all my seminars is: Was the information delivered in such a way that the person listening can take it out and use it on the water? The Bass to the Future seminar is designed to do just that. Bring a pad of paper and pen to record stuff because if I do my job right, you should be able to walk away with a few more pieces of the puzzle which can fit into your style and add to your toolbox of techniques. Prepping for the upcoming season can be a great way to shake the winter blues along with fixing or maintaining equipment, adding new technology, baits or skills to use this year. Confidence and anticipation are high which is something to take advantage of before the season gets busy and locks us into a fixed schedule. Myself, I’ve been going through my hard drive and sorting and renaming folders, arranging handwritten notes from previous years to make them handy, getting equipment fixed and making or tightening up plans with an emphasis on the little things that normally get done at the last minute. Nothing here is particularly new as far as information goes it’s just me using the current high energy levels to handle some details today so they don’t mess with the flow of having fun tomorrow. One such detail did escape my tournament partner and I… We had planned nearly a year in advance to fish a tournament on Lake St. Clair. It was still early in the season and my partner had an exceptionally busy spring at work with little time to get out on the water. It wasn’t until the late afternoon before the tournament that we realized he didn’t have a Canadian license yet. This prompted some phone calls to my friends in Canada only to find out that most places weren’t carrying licenses anymore and some of the old standby’s that did were going to be closed before we could get there. With some expert help from Bob Mann Sr. we managed to get to one of the few remaining Canadian Tire stores that still sold licenses with about 20 minutes to spare. Success yes, but not something I would want to repeat. So let’s get together at the show and talk about fishing this year. I’ve got a new, retooled Bass to the Future presentation for you to see but best of all, if we can find a way to connect this universe of information to your angling goals, the seminar can have great value toward helping you prep for the upcoming season. Seminars can be high entertainment for anglers in cabin fever lock down and can also be a fast way to connect with professionals and unlock some of their secrets. Whether you make a dedicated trip to see a seminar speaker or take advantage of the many free seminars at your local fishing show there are some things you can do to build on your personal skills. I find that may seminar participants have been associated with my services or products and are looking to see about the latest developments for the coming season. Most audiences are mixed while some have a strong influx of new folks checking out the speaker or topic for the first time. In the case of the latter I would suggest taking advantage of this great information age and get hold of all the material you can on a speaker to study up prior to the event. All seminar speakers have limited time to deliver a select topic so the more familiar you are with both the potential content and the way the person delivers it, the more you will be able to retain for future use. It might not always be possible for both to attend but a fishing buddy with you at a seminar functions much the same as on the water. Both get a look at the presentation and delivery (environmental conditions if you will) and evaluate it together. The wealth of knowledge and experience you share can filter, sort, extract and retain more information between you than either could alone. Since most people who attend seminars already have a great deal of angling experience the best part of the event for them will be that one nugget of information that jumps out at them as unique or useful. Taking notes of everything can be helpful but documenting the small details about line diameter, depth, temperature, brand name, action, presentation or other such technical points comes in handy later when it’s time to execute. I’ve never met a seminar speaker yet who didn’t enjoy answering questions from the audience after their presentation. The speaker knows the content and purpose of their delivery but the audience brings with it a wide range of experiences which adds spontaneity. It’s the stuff that sometimes nobody else has thought of which can make for an interesting exchange. Also, chances are that the speaker has been there and done that and will have a tip on inexpensive or effective solution to something that’s been bugging us. Walking away with contact information for the speakers you are interested in can come in handy when you least expect it. In the middle of the season a question might come up which might be answered in an email. A quick visit to their website might be all it takes to get you over the hump with a piece of critical information about a spot, bait or technique to be used the next day out. Books, DVD’s and other resources created by the speaker are their efforts to get even more information out to you than they can in a short seminar. This sort of reference material can be as valuable as a personal log book for the angler wanting to learn and absorb as much they can about their sport. We’re gearing up for a new round of Bass to the Future seminars at the upcoming Outdoorama show at the Rock Financial Showplace. What you can look forward to is more data files to choose from in Fishing Spot Specs, in-depth look at the new Marked Maps Live! 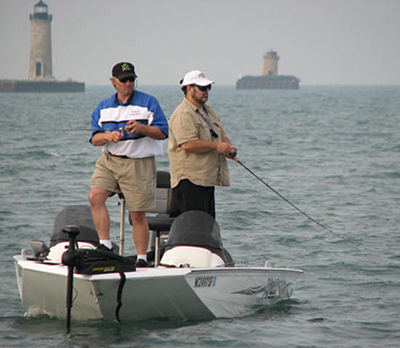 website, some FREE stuff you can use online to help with your personal research, SeaViewer ™ underwater camera video and demo along with info about the new Xtreme Bass Tackle baits for 2010: Mayfly, Muskegon Goby and the new creature bait in St. Clair Crayfish. That’s a lot for one seminar so be ready for a fast paced format with two screens and live internet. If you’ve seen this seminar at the Ultimate Fishing Show it might pay to see it again. I’ll have new video clips plus updates on how to use the new search engine at Fishing Spot Specs. The seminar is free and questions are welcome. Post your question on this blog, let me know what day you will be coming to the show and have it answered at the seminar. If you comment on the blog you qualify for a 2-4-1 pass into the Outdoorama. Just send your name and address directly to me at: wayne@combat-bassfishing.com and I’ll get it out to you. It’s the last day of the show already and we have one more chance to get together at the seminar. Today it is at 2pm on Stage C and it’s back to Bass To The Future with a look at the new information search engine, http://www.fishingspotspecs.com which went live on Thursday, January 7th. Thank you to so many who filled the room at yesterdays seminar. For those of you who are looking for it, I have the sonar logs in my pocket as I write this and we will for sure get the Lowrance SonarViewer rolling with some real data pulled from Lake St. Clair. See you there! Nothing like rolling out the best fishing information available to date and someone in the room asks for more detail yet. What a lot of folks probably don’t know is that I like to go to seminars too and questions of that nature keep me coming back for more. What I laid out was the spot, the quality of fish caught on the spot and what time of day and the bait. That’s exact location, quality of the bass (in this case – tournament quality), it was in the afternoon and the bait was a spinnerbait. The question was, “How long did it take to catch the bass?” My answer, “If you are an information customer, and those of you in the room who have been know this to be true, I have never denied anyone more detail about one of my products if they’ve asked for it.” In this case the product we were talking about was the new Marked Maps Live! chart with live information from myself and the staff as we cover the Lake for work, sport or relaxation. The other information product, http://www.fishingspotspecs.com would be one source of exactly the kind of information that my new friend at the seminar was looking for. With respect to the Marked Maps Live! product he was referring to my answer stands and he would be welcome to follow up with an email or phone call to clarify the data however this is the type of data that is routinely put into http://www.fishingspotspecs.com. For example: “This sand flat is so vast that these depressions tend to hold and on this day we had to work hard for one 2 lb. smallie and one short fish.” This is a live information excerpt from one record (report) from the new website. This same report contains over six more pieces of data for clarification that relate to the text above. The next surprise came after I had detailed how I design baits based on my research. I also told the story about how back in 1999 and 2000 I was giving tubes with purple flake away to smallmouth anglers who grudgingly took the FREE samples and said, “Purple is a largemouth color.” The question was, “What research went into the design of Canadian Mist?” I’ve been doing seminars dedicated to bait design for years and this was a first. My answer was, “This was a tube from a distributor who was unreliable so I went direct to the factory.” To clarify, at the time this happened it was customary to go through a different distributor for this particular bait and that relationship stands to this day. What was the research? Smallies love purple, I knew it and pushed the concept hard to anybody who would listen. My how things have changed. See everyone today at 5pm. First two seminars in the can so what’s next for Fri, Sat, Sun? If you’ve attended my seminars in the past you would likely know that every presentation was different than the last. Not just how the seminar was presented but the content too. This time around there is a real need to get the message out about two new internet based products, http://www.fishingspotspecs.com and the new Marked Maps Live! Current customers benefit because the sites tie into my other information products they already own: Combat Fishing Newsletters, No Secrets on Lake St. Clair 1 & 2, Smallmouth Confidential, Marked Map Series 1 & 2 and Electronic Guide Service downloads. The benefit of combining those products with both the live and historical information presented on the websites is a powerful tool to have and this round of seminars is a fast way to bring that together. For the new folks, they are being exposed to an information technology of a kind they have never seen before. It’s not exactly like seeing the latest movie with cutting edge graphics technology but close; you don’t have to pay for the seminar and what you see and experience can be applied to the real world for real results. Even better! My thanks to the folks who worked through the first seminar with me. It was very difficult to do a presentation that flowed from one point to another with the WI-FI slowdowns. The second seminar at 8pm flowed smoothly with no WI-FI slowdowns at all, go figure? We did have a loss of signal at the beginning but after that it was clear sailing. The next seminar is today, Friday at 4pm and we will have a couple of new additions in the way of underwater video that weren’t shown at the first two seminars and some closer looks at the Seaviewer underwater camera.